The parable of the Wedding Banquet has often been understood as illustrating God’s offer of salvation that some people reject and so miss out on the fun. That understanding seems to work in Luke’s version but it doesn’t work out so well in Matthew’s. Here, the king’s invitation is met with violence which the king reciprocates with interest and then he bounces a man who isn’t dressed properly and has him thrown out into outer darkness. The severe dissonance of these details inclines me to consider alternate interpretations of this parable. Marty Aiken has written a detailed paper arguing for just such an alternative understanding. (See “The Kingdom of Heaven Suffers Violence: Discerning the Suffering Servant in the Parable of the Wedding Banquet.” He argues that Jesus’ listeners would have immediately thought of King Herod when they heard the parable. The king in the parable certainly acts like Herod. These listeners would have remembered Herod bringing an army to Jerusalem and asking the people to accept him as king. If the offer was accepted, Herod would have consummated the deal by marrying the granddaughter of the high priest Hyrcanus. There’s our wedding feast. The people of Jerusalem turned down the offer. Herod withdrew but then came back with his army and stormed the walls without stopping to negotiate. Antigonus, a descendent of the royal family, gave himself up to quell a violent situation. He was carried off in chains and beheaded by the Romans to give him a particularly humiliating death. With this background in mind, we can see the guests who “made light of” the invitation as representing those who went home when Herod came calling and hoped everything would blow over and they could get on with business as usual. The other invited guests represent those who resisted Herod with violence. Both groups of guests are met with violent reprisals from the king in the parable. The rounding up of guests to replace the first lot is not, then, an act of charity for the poor but a forced gathering of whoever the king’s slaves could find. With this interpretation, the cryptic scene of the man without a proper wedding garment makes sense as being the second part of the same parable and not a separate parable tacked on to this one. The king seems to be looking for a victim and he finds one handy, one who stands out by his attire. Like most kings, this one knows that the quickest way to unite a people is to focus on a victim. Moreover, this guest seems to be what we might call a nonviolent protestor, which obviously is threatening to the king. This guest’s eerie silence suggests Jesus’ silence before Pilate which Matthew emphasizes. Aiken points out that grammatically, the king could have been the speechless one, which would refer to Isaiah 52: 15 which says that kings will “shut their mouths” because of the suffering Servant. The fate of this guest is the fate Jesus himself suffers which had already been the fate of Antigonus. The Kingdom of Heaven, then, is not the banquet but the place of the victim who is cast out. Aiken recalls Jesus words in Mt. 11: 12, that up to this time, the kingdom has “suffered violence.” And so it does. All of this is disappointing for those of us who are edified by the idea that God throws a heavenly Banquet and invites all of us to it. I find this image appealing and I don’t want to give it up. We don’t need to. 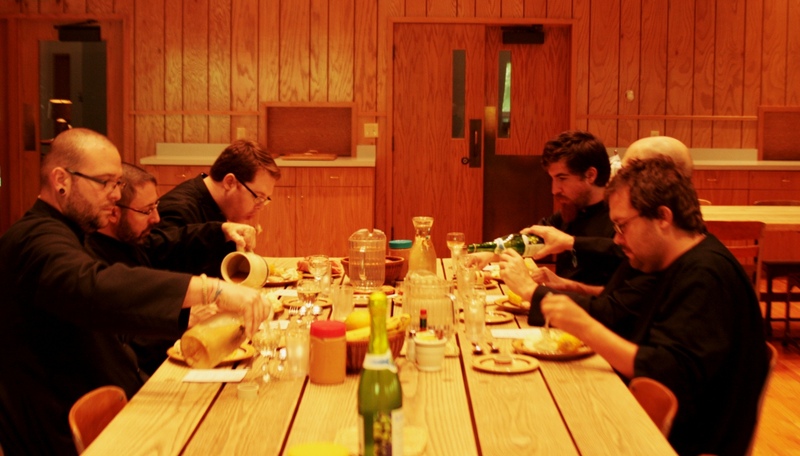 The theme of what scholars call “the Messianic Banquet” is very real. The reading from Isaiah 25 is one example but treading the Moabites down into the dung pit smacks of Herod more than God. The invitation to the banquet in Isaiah 55 is much more positive and clearly is extended to everybody, presumably even the poor Moabites. The real image of the Messianic Banquet in the Gospels is the feeding of the five thousand and four thousand in the wilderness. Here is a generous feeding to all comers with no reprisals for anybody who happened to stay away. No political force is exerted in the invitation. Nobody gets thrown out for being badly dressed. The poor are not afterthoughts, invited only the replace ungrateful aristocrats. The poor as well as the rich are all invited right from the start. The banquet offered by Jesus in the wilderness, away from the centers of worldly power, shows up the king’s banquet in the parable for what it is. Instead of an offer we cannot refuse, we are given an offer that we do not wish to refuse. This really is a cause for rejoicing always in the Lord, as St. Paul admonishes us.